All I have to say is, I'm sad to lose such a powerful, talented and thoughtful voice. However, I'm grateful that his words live on. Oh no! 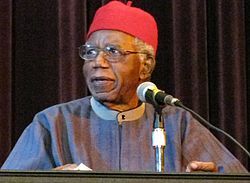 Chinua AChebe is dead? Well, he was 83. What a great writer, and a fantastic human being. What a legacy he leaves behind. It's GOOD to be a writer. Very true, Aaron. I truly believe writing and words are important, and sharing what you write is equally important. I can't believe it. Thank you for posting this.